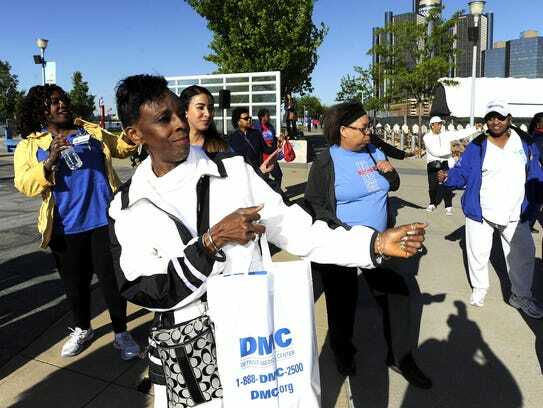 Detroit — In its ninth year, the Detroit Medical Center’s RiverWalkers Celebration challenged about 2,000 seniors to lace up their sneakers Tuesday morning. The program is a free community event for seniors to gather every Tuesday and Thursday morning to stay active. During the celebration, seniors learned CPR from DMC physicians and talked with doctors about their health. Before they started walking the riverfront at their own pace, Wayne State University medical students volunteered to check the seniors’ blood pressure. Scott Steiner, CEO of DMC Detroit Receiving, Harper University and Hutzel Women’s hospitals, said RiverWalkers started as a one-time idea to connect the community in Detroit, and the positive feedback and turnout made it an annual summer program. Detroit native Cathy June, 57, a nurse educator has worked for DMC for 35 years and said in honor of National CPR Awareness Week (June 1-7), she and other volunteers taught a two-minute CPR session. “When I was down here last summer, we had about 500 seniors and it was fun because the first day they came, compressions were not so deep, not so fast, but by the end of the summer, they were able to do good, solid CPR,” June said. She said this year they have partnered with the American Heart Association, which donated 150 kits to the DMC so the walkers who get the two-minute training can educate others. Some, like Charles Reedly, 72, joined the RiverWalkers with a friend five years ago and gained more friends including Colon Carmichael, 72, who has been a RiverWalker for eight years. “There’s five of us now and we walk more than just Tuesday and Thursday. I walk every day. About five miles every day,” Reedly said. When the RiverWalkers started in 2008, they had around 200 seniors at each event. This summer, DMC is expecting to average about 450 seniors to every Tuesday and Thursday morning. The program is active June through August and meets at the carousel. Seniors must be 55 years old to join and the program has members as old as 102. Walk About suggests that adults ages 50 to 70 years old should be walking a minimum of 6,000 steps a day. Willie Howard, 68, said the program was very helpful after retirement.